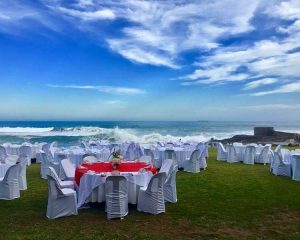 Whether a meeting for 2 persons, a team building venture or a high-powered conference for 240 delegates; the resort’s prime position, generous grounds; varied choice of well-appointed and professionally-serviced conference rooms makes this the perfect venue to host your function. Your business is our pleasure. 24 hour package: R 1470 per person per night sharing and R 1750 single. Day Conference Rate is R 525 per person. Morning & afternoon tea/coffee/juice with eats. Standard conference equipment, flip chart, screen, pens & paper. Morning OR afternoon tea/coffee/juice with eats. Cordial, water and wrapped mints.